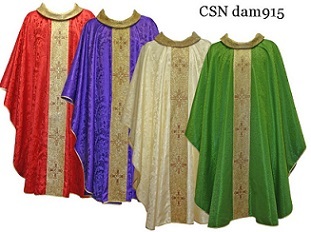 100% Polyester, in all liturgical colors. Embroidered with brilliant Gold metallized threads. 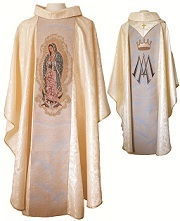 Damask Chasuble 100% Polyester with Gold Woven American Band Rays and image. WovenBand: 40% cotton, 40% polyester, 10% lurex, 10% other fiber. 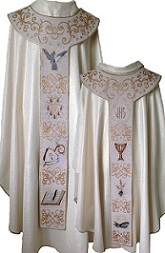 100% Polyester Damask Chasuble with a woven Silver Band and crewneck. 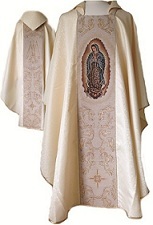 Chasuble Special - This beige "DAMASK" chasuble is a nice light weight 100% polyester. The woven band is made with brilliant Gold thread highlights and made of 45% Cotton, 45% Polyester, 5% Metalized polyester, 5% other. Matching Stole included. Also Availalbe in Deacon Stole. 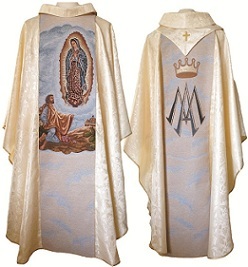 Chasuble Special - priced to celebrate OLO Guadalupe and Juan Diego. This beige "DAMASK" chasuble is a nice light weight 100% polyester. The woven band is made with brilliant Gold thread highlights and made of 45% Cotton, 45% Polyester, 5% Metalized polyester, 5% other. Matching Stole included. 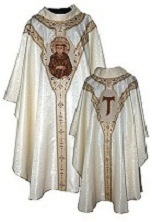 DAMASK chasuble with woven band made with brillant gold lame' relief threads, standard size 48" Long, 59" Wide, with Square Collar. 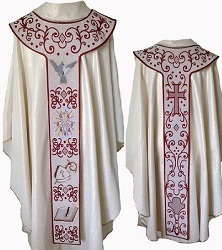 RED Cotton Chasuble made of 45% Wool and 55% Polyester. Gold Band woven with Metalized Polyester threads. 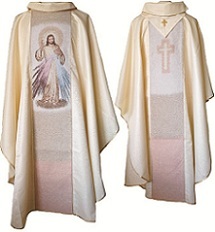 Chasuble made of 45% Wool and 55% Polyester. Gold Band woven with Metalized Polyester threads. 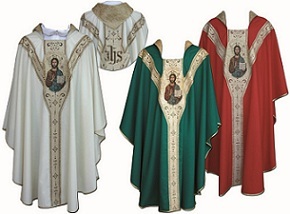 *Chasuble available in all Liturgical colors. 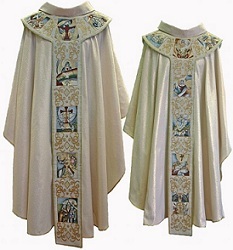 Red Chasuble made of 45% Wool and 55% Polyester. Gold Band woven with Metalized Polyester threads. 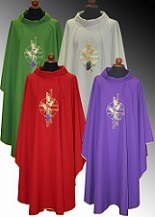 **Chasuble available in all Liturgical colors. 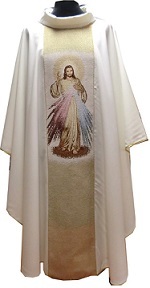 PALLIUM scapular woven and made with brilliant Gold Lame' Relief threads, 45% Cotton, 45% Polyester, 5% Metalized polyester, 5% other and 100% Polyester Lining. 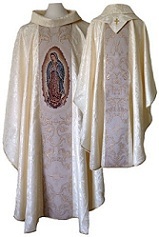 Chasuble sold separate. PALLIUM scapular woven and made with brilliant Red Lame' Relief threads, 45% Cotton, 45% Polyester, 5% Metalized polyester, 5% other and 100% Polyester Lining. 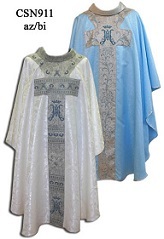 Chasuble sold separate. With words "Jesus I Trust in You" 19" x 8"
Hanging Tapestry 8" x 12"
Hanging Tapestry Appox. Size 8" x 17"
Hanging Tapestry approx. size 8" x 20"